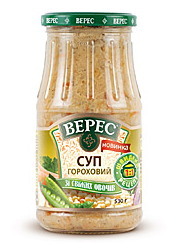 Pea Soup is a common, very yummy and nutritious soup. 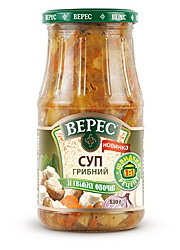 If you like this soup but don’t have the time to cook – we have a solution for you – Veres concentrated pea soup base. Dilute it in boiling water, add some bacon, parsley, dill, spices and the soup is ready! Yummy! Mushroom soup is a traditional European soup favored by many. Again, the cooking is super fast and fun! The mushroom soup is a concentrated base prepared with the best champignons and fresh vegetables. Just dilute it in boiling water, add spices, bacon, fresh parsley and dill! The soup is ready! 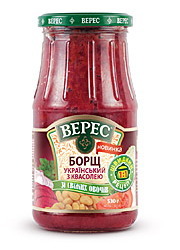 Borsch with beans by Veres is a concentrated soup base that will help you to cook the best borsch that would surely taste like it was prepared at home with love and care. Just add boiling water, spices, parsley, dill and bacon (for meat flavor).